Papell with Love: Altenew May 2017 Release Blog Hop & Giveaway!!! 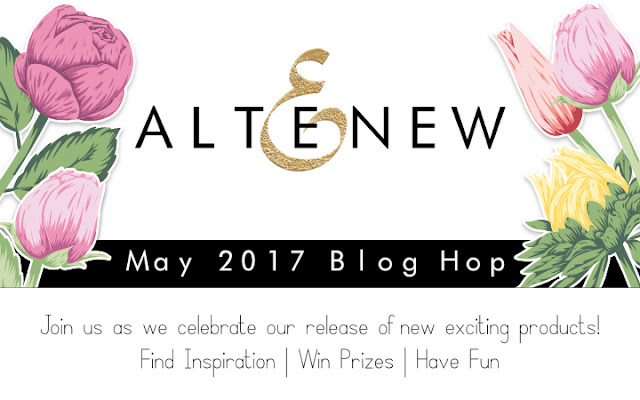 Altenew May 2017 Release Blog Hop & Giveaway!!! Hello Everyone, welcome to Altenew May 2017 Release Blog Hop! If you are hopping along you should have arrived from Raquel Bowman's Blog. To begin, I first distressed my card base with Distress ink in Peacock Feather and Twisted Citron. Then splattered some water and diluted Peacock Feather. Then stamped it with the flowers from Under the Cherry Blossom Tree stamp set. Next, I die-cut (x4) the Cherry Blossom branch, made a square wreath, and colored them with copic. 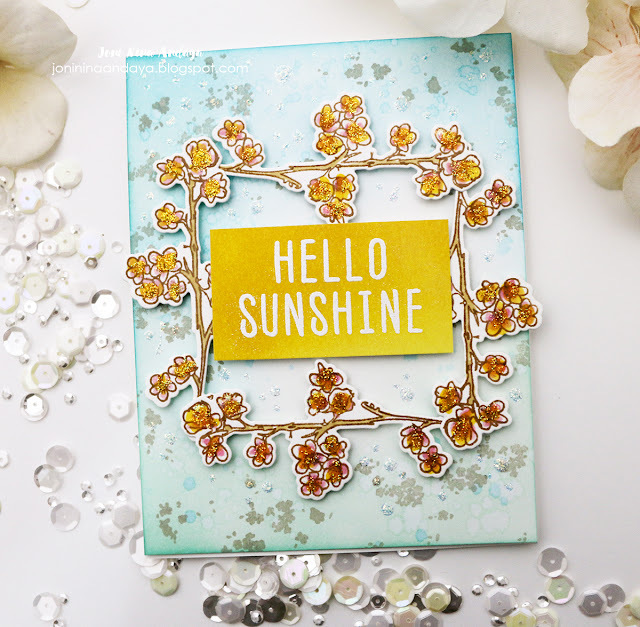 For my sentiment I used the Hello Sunshine stamp set and heat embossed it with white embossing powder. Then adhered the sentiment with foam tape for dimension. Next, I distressed only the bottom of the card panel with Lawn Fawn dye ink in Doe. 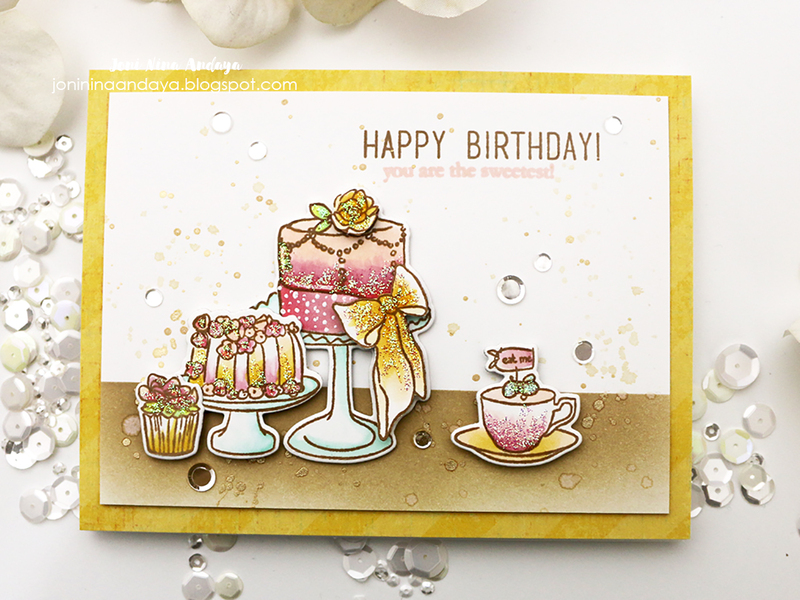 I also spattered the background, then colored the cake images from Cake Love stamp set. After coloring I also used the coordinating Cake Love die set. The sentiment was also from the same stamp set. For added touch I added some Diamond Stickles on the images and Sparkling Clear confetti mix from Pretty Pink Posh to finish off this card. For my last and final card, for this card I started by distressing my cardstock panel with Distress ink Twisted Citron. Next, I splattered water on the panel and gold watercolor paint. Then stamped the sentiment (Crafty friends are the best) from Crafty Friend stamp set. Next, I added some flowers from Beautiful Day stamp set as well. I also die-cut a Pretty Pink Posh Scallop Hexagon dies and that finishes the card. your next stop is at May's Blog. Altenew is also giving away $30 gift certificate from my blog. Please leave a comment here by May 31st. I will announce the winner on June 2nd here as well. Your work is always amazing Joni! These are all spectacular!! Love your cards! Such pretty color combinations. I really love the green background on the last one. Your distress ink background are amazing. Thanks for sharing your pretty cards. I love, love, love your birthday cards. So cute and i love the soft colors you used. Beautiful cards! Very nice coloring and backgrounds. Pretty cards. I like the cakes. Your cards are just LOVELY!! The cakes on the 2nd card look good enough to eat! And I love the zingy colours of your "crafty friends" card. Would be great to win something so thank you for the opportunity. Pretty cards. I especially like the cake. Pretty cards! My favorite is Cherry Blossoms. They are fantastic! I love the way you play with colours. Beautiful cards! I think the background on the Crafty Friends card (well, really the whole card) might be my favorite if I had to choose one.... 😁 Thanks for sharing!!! All of these cards are great. Love the cake one the most. Great cards. Love the colour combinations you chose. The birthday cards looks so yummy. Your creations with the Cheery Blossom tree stamps/dies sets are gorgeous. I noticed these sets immediately, they give a lot of possibilities for cards. Wow, such pretty cards! I just love the softer colors. Both are so lovely. Glad to see you on this hop. Cute, cute cards, I love those cake images! So bright and wonderful, your cards are beautiful. Seeing how you used the cherry blossoms just makes me want it more! Such pretty cards! Love the crafty friends one. These are such lovely cards! Love them! Love the green card in particular! So many elements and its' just a gorgeous design. I had to pin it! Great job today! Love the sentiment about crafty friends. Very nice cards. These cards are stunning!! I love how you used the cherry blossoms to create a frame, but that birthday cake card is gorgeous and your last card is just beautiful. Thanks so much for the inspiration! Very good combination of creativity using Altenew's products! Lovely cards. What a great idea using the Cherry Blossoms die cuts as a frame. I think my favorite card is the bright and cherry "Crafty friends...". Great cards! Love the frame you created with the branches. Such pretty soft colours - great colouring. Your cards are so sweet and lovely!! Your pretty cards make me happy!! Your cards are very pretty. I really like the square wreath you constructed on the first card. Very eye catching. Joni, I just loves these cards! Each one is so beautifully constructed. You showcase the new release so well. Thanks for being part of this blog hop. I love how you used the cherry blossom as a frame--great idea! love that set (as well as the "Under the Cherry Blossom Tree" set). These cards are beautiful! This release is great! They are all very nicely done but my favorite has to be the birthday card. Thank you for sharing. Love your cards - especially the second one. Another really lovely release. I especially love the Budding thanks set and those layering dies! I agree...very sweet card...beautifully done. lovely cards - first one is my favorite!! Amazing cards! Love your color choices. Love the square frame with the cherry blossom branch. So pretty. Beautiful cards, love your coloring ! I always love your cards! I especially love the crafty friends card here. Thanks so much for sharing. Beautiful cards. The first one is my favorite !! Beautiful cards!The first is my favorite!Love the color combo! Lovely cards! I love this Altenew release! Your cakes are so LOVELY! Such gorgeous cards Joni, I especially like the green one. Love the cherry blossoms used as a wreath! So beautiful! The cake card is making me hungry! The Crafty Friend set is must have for me! Perfect sentiments! Your cards are so lovely. I love the coloring. Great job. Your cards are really lovely. Love the coloring. Thank you for sharing. What cheery cards! I especially love the cakes. Such sweet cards. Love the colors you chose. I love your cards today. They are just beautiful. The one with the cake just made my heart skip a beat ! Pretty cards! Nice job...Loving the new releases. What beautiful cards. Love the soft colors. Beautiful cards. 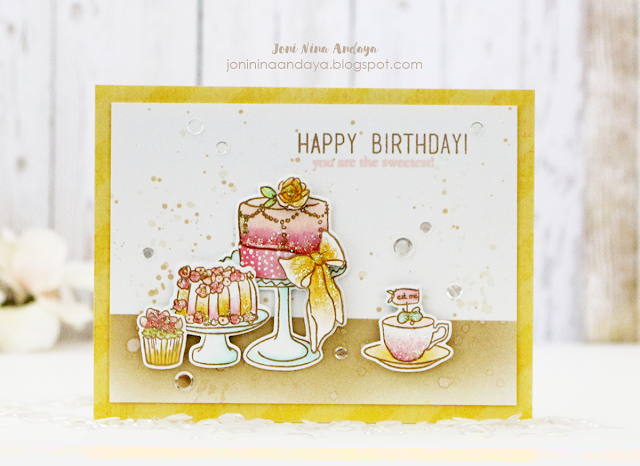 I love the Cake Love stamp set from Altenew and your card showcasing it is delicious! LOVE your Hello Sunshine stamp - so cheery and friendly and sparkly. Thanks for the inspiration. So cool how different everything can look just by using a different embossing powder! Beautiful cards. The happy birthday card is especially gorgeous. Love your card using the cake stamps. What an elegant birthday card! Adorable cards, LOVE the sweet happy birthday card! Love your cards - you have a way with bringing colors together. Beautiful cards, so soft and sweet! Great cards! Love the hexagon. It's colored beautifully. Your cards are fantastic. Love the creative ideas. Lovely imaginative cards, Joni! I especially like the "Cake Love" card. Wonderful cards and beautiful colours. Love them all! I love the added detail of the first card with the flowers stamped on the background--subtle, yet effective. Those cakes look good enough to eat! And a reminder to myself: a white frame pops on a card! Thanks for all the loveliness! Beautiful cards! Love the last two the most! These are so spectacular! Just love everything about them! You have given me some inspiration for my weekend crafting! Loving that cake love stamp set. So cute! Thanks for the pretty cards! Love your cards, they are so serene. Beautiful work. All 3 of your cards are gorgeous! 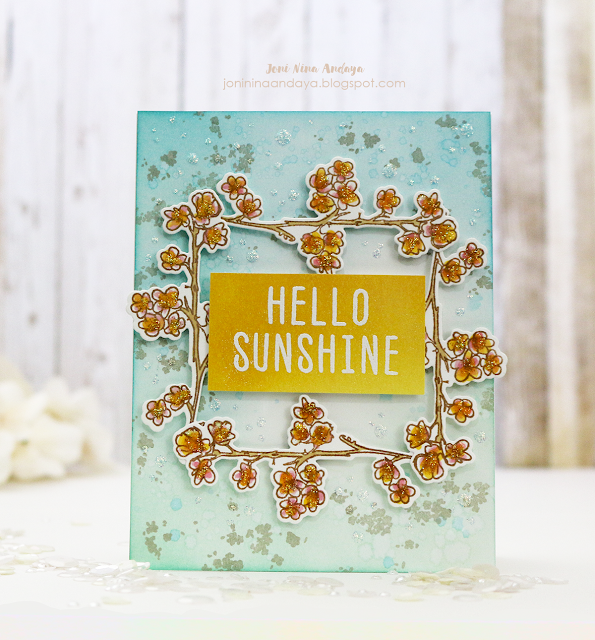 I love the background you created for your first card and the way you created a frame with the cherry blossom branches was so clever and looks amazing. I enjoyed my stop at your blog. Your creations are beautiful. Love the frame of cherry blossoms. The card with the food is fantastic. Really like how you used the branches to make a frame! Your cards are gorgeous. Lovely soft coloring. I'm new to your blog and bookmarked it! I love the little tea party card! So cute. The first card with the floral frame is also sweet! Nicely done. Love how you used part of the stamp set to make a frame. Thanks for the great inspiration. Beautiful cards, love the cherry blossom frame, the yummy cakes with amazing coloring and your fun and bright green background. Wow! Love the projects! Thank you for sharing! Beautiful card! I love how you created the frame on the first card and the composition and coloring on the second are so sweet! Your cards are really pretty. Thanks for sharing..
Beautiful cards...I loved the birthday one with the tea party scene...totally magic! Love the softness to your cards. Thanks for sharing! I love all your cards. The green background is beautiful!!! And your cake card has me wanting to sit down for a birthday cake celebration! Lol. Your cards are simply elegant - just the way I like them! Beautiful release! Ery pretty cards. Love the cake bday card...soft and feminine. Your distressed backgrounds are gorgeous. And I love the dainty colors on the birthday card. It just all goes together so well. I like how you used the cherry blossom branch as a frame! This trio of cards makes my heart sing! They are all so elegant and lovely! Under the Cherry Tree is such a gorgeous set and the more I see it being used, the more I know that I need to add it to my stash! TFS! Fabulous cards. I like the framing of the sentiment on two of the cards. Love how you created the frame with the branches, so creative! The backgrounds on all the cards are so beautiful! Such a pretty mix of card designs! These are beautiful! Love your blue and yellow together on that first card! I love the new release and your inspiration cards are awesome! I especially love the second card. It looks good enough to eat! The square wreath was an amazing discovery! I never think of stuff like that! Very Creative! Love your frames and amazing coloring. Hello Sunshine...hello Beautiful!! Great cards!! Love your style, your soft colors are so nice! The Happy Birthday card is my fave !!!! Awesome creations!! I really love your Happy Birthday card! All of your cards are gorgeous, I particularly love the cake love set. Thanks for sharing! You cherry blossom frame and that scalloped hexagon framed card are SO cool! Your cards are so pretty! Love the delicate colors! Such a great release and amazing blog hop! So much talent and inspiration! Thanks for sharing yours! Your cards are so beautiful! The first one is my very favorite! So clever to make a frame out of the cherry blossoms. Gorgeous cards! Love the elegant card with the cakes... so pretty! Wonderful coloring! 3 GORGEOUSLY done cards! Love you zeal for colors and design!! Love the cakes! But the others are stunning as well!! Beautiful cards & a fabulous release! Such lovely cards. Thanks for the inspiration. Looks like a great release. These are all gorgeous! I especially love the first one. Beautiful cards!! I especially like the birthday cake card. This release is super! Love the buds and the iris! Altenew flowers are the best! Fantastic cards! I love the colors and I really think that birthday card is outstanding! Beautiful cards!, especially the birthday cakes! These are gorgeous. Love the colors you chose to use. Wonderful cards! I love the different looks and the showcasing of the new release images. Gorgeous cards Joni. Love the way you used the cherry blossom branch... so neat... the hexagon frame looks lovely on the last card. Great cards! Your colors are fantastic. My favorite is the Hello Sunshine card. How clever to make a frame from the cherry blossom branch. The second card is so beautiful with the soft coloring. I like the flower cluster on the third card too. wonderful card ideas. thanks or sharing with us. Very pretty cards! I like the Happy birthday one the best I like how you made that table scape with all those little stamps I am never sure what to do with. 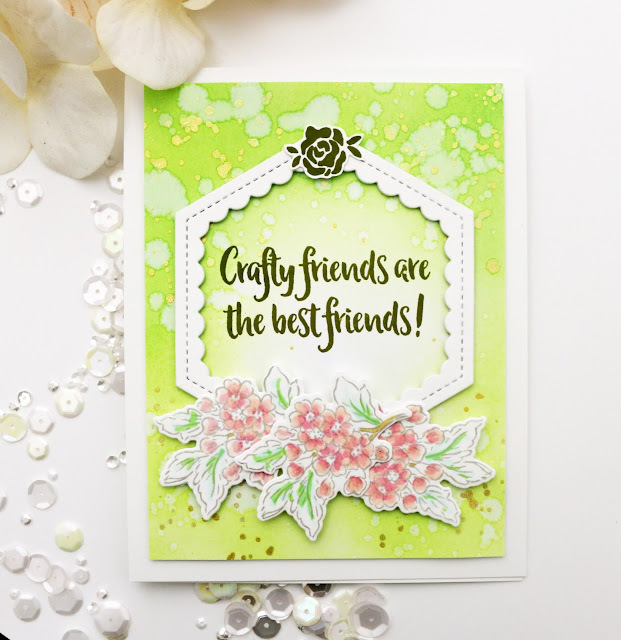 Love your beautiful card creations, especially the one using the cherry blossom design set. Three absolutely beautiful cards! Love what you did with the cherry blossoms. Your colouring & design is always amazing. Love the effects of the diamond stickles on the sweet card! Wow, your cards are so pretty! I see lots of my favorite color, yellow, on some of your cards. That makes me smile. I love those cherry blossoms because they look so real. That is the stamp I want to get when I win. That birthday card is so pretty! I love it! Everyone could always use a nice birthday card and boy is that one. Your card is one of those expensive looking Hallmark cards and if I was making it and selling it at a crafts fair mine would be expensive too. The last card is so cute! I love how it looks and I love the green color. That's one of my favorite shades of green. Thanks for showing us your beautiful cards and for giving us a chance to win something. I want that cherry blossom stamp so bad! I like the fresh perspective you've taken with each of these pieces. I also like how you used not only water, but additional colors for your background splatters on each. Great cards, I am now in love with that Twisted citron and what a great idea to splash gold watercolors. Thank you!! Beautiful cards, love the second, its so pretty. Your cards are exactly what I strive to create! They are so beautiful and so is the lucky person who receives one! Thank you for so much inspiration. This is the first time I've seen your work and I think I've stumbled onto something fabulous. You have a lovely variety of cards. Great inspiration everywhere! Lovely cards - really like the square wreath and the pretty cakes! Love your backgrounds! I especially like the Hello Sunshine card. Great inspiration, thanks! PPP - May Release Blog Hop! WINNER of Altenew Celebrating Blog Hop!